Wall penetrations are sealing circuits. According to the application, there are different wall penetrations available. 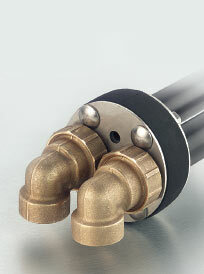 Ø 50 for 50 HT-pipes for the supply of potable water. Cable for power supply of submersible pump and for measuring the water level Ø16 for the PE-pipe of the backwashing device. A wall penetration consists of a 30 mm strong rubber sheet with 2 discs and screw connections made of stainless steel. Circuits and cables are pulled through the corresponding openings. Then the wall penetration is being fitted in the end of the empty conduit. The srew nuts are pointing outwards. 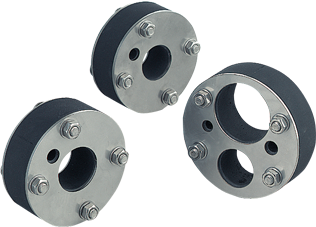 The srew nuts are tightened, therefore the two discs of stainless steel are pressing the rubber seals against the wall of the empty conduit therefore sealing the connection waterproof.